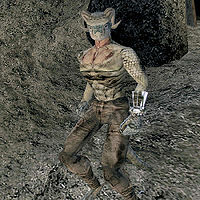 Eleedal-Lei is an Argonian slave found working at the Telvanni-operated Abebaal Egg Mine. Eleedal-Lei is the leader of the slave rebellion currently underway in the mine that you, as a member of House Telvanni, have been asked to quell. He is wearing common pants, a slave's left bracer, and is wielding a spiked club. Like all Argonians, he is immune to poison, has a resistance to disease, and can breathe underwater; otherwise he knows no spells. Slave Rebellion: Put an end to the slave revolt in Abebaal Egg Mine near Tel Branora. "Yes, we are rebelling. If Therana sent you, go ahead and kill us." Order them back to work. : "I would rather die free than be a slave again." Goodbye. Kill them. : "I would rather die free than be a slave again." Goodbye. Listen to their grievances. : "Therana is mad. She demands more and more kwama eggs, and when the mine is empty, she still demands more. I delivered the eggs last time, and found she was not even eating them. She was decorating her home with rotting kwama eggs. It was then I decided I could not go on." Keep listening. : "I am surprised you are willing to listen... Will you help us? I was a sorcerer in Black Marsh, but I cannot cast spells with these slave bracers on. Will you find the key to our slave bracers and free us? There may be a key here, but we have not yet found it. I am sure there is a key in Tel Branora." Agree to free them. : "You will free us? I am not sure I believe you... Very well. Try and find a key to my slave bracers in Tel Branora or here in the egg mine. Once I am free, I will let the others go free and lead them to safety." Order them back to their duties. : "I would rather die free than be a slave again." Goodbye. "Have you found the key? Will you ley [sic] me go free?" "Yes, I will free the other slaves. I will guide them back to Black Marsh when it is safe." "If you want to set us free, look for the key to our bracers somewhere here in the egg mine or in Tel Branora." "Have you found the key?" Nevermind. : "If you set me free, I will free any slaves that remain here and lead them to safety." "Yes, I will free the others. Soon we will return to Black Marsh." This page was last modified on 12 November 2014, at 04:29.